Obama Nominee Admiral Dennis Blair Aided Perpetrators of 1999 Church Killings in East Timor (Part II) | Democracy Now! AMY GOODMAN: Right now we’re going to turn to President Obama’s cabinet. The President-elect Obama is facing a political challenge over his choice to run the Central Intelligence Agency. Obama has tapped Leon Panetta, a former Congress member and White House Chief of Staff under President Clinton. Many observers call him a surprise pick because of limited intelligence experience and his public opposition to the Bush administration’s policies on torture. Obama defended Panetta’s nomination at a news conference yesterday in Washington. PRESIDENT-ELECT BARACK OBAMA: I have the utmost respect for Leon Panetta. I think that he is one of the finest public servants that we’ve had. He brings extraordinary management skills, great political savvy, an impeccable record of integrity. As chief of staff, he is somebody who — to the president — he’s somebody who obviously was fully versed in international affairs, crisis management, and had to evaluate intelligence consistently on a day-to-day basis. Having said all that, I have not made an announcement. When we make the announcement, I think what people will see is, is that we are putting together a top-notch intelligence team that is not only going to assure that I get the best possible intelligence unvarnished, that the intelligence community is no longer geared towards telling the president what they think the president wants to hear, but instead are going to be delivering the information that the president needs to make critical decisions to keep the American people safe. I think what you’re also going to see is a team that is committed to breaking with some of the past practices and concerns that have, I think, tarnished the image of the agencies, the intelligence agencies as well as US foreign policy. Last point I will make, though, on this is that there are outstanding intelligence professionals in the CIA, in DNI and others, and I have the utmost regard for the work that they’ve done, and we are committed to making sure that this is a team effort that’s not looking backwards but is looking forward to figure out how we are going to serve the American people best. We go back now to the story of top Democrats chiding Obama for not consulting with them before announcing the pick and have suggested they might oppose Leon Panetta to be head of Central Intelligence Agency. In a brief statement, the new chair of the Senate Intelligence Committee, Dianne Feinstein of California, said, “My position has consistently been that I believe the agency is best served by having an intelligence professional in charge at this time.” The outgoing Intelligence Committee chair, Democratic Senator Jay Rockefeller of West Virginia, says he shares Feinstein’s concerns. It’s interesting to compare that to how lawmakers are greeting Obama’s other top intelligence pick. While members of Obama’s own party vow a tough confirmation hearing for Leon Panetta, who has written against torture during the Bush administration, they’ve expressed no reservations about another nominee who has been accused of supporting torture and murder abroad. The former commander of the US military forces in the Pacific, Admiral Dennis Blair, has been tapped to become the Director of National Intelligence. He would be Panetta’s boss. It’s the nation’s top intelligence job, overseeing sixteen agencies. Admiral Blair played a critical role in backing the Indonesian occupation of East Timor during the 1990s. At the height of the wave of attacks on Timorese that killed hundreds and displaced tens of thousands in 1999, Admiral Blair personally informed top Indonesian general, Wiranto, of unwavering US support. 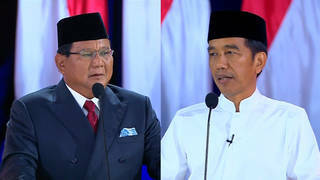 He continued to support the Indonesian military until international outcry forced the Clinton administration to withdraw its military and diplomatic backing. Yesterday, we began our conversation on Dennis Blair with Allan Nairn, an award-winning investigative journalist who has reported from Indonesia for years. In 1999, he broke the story on Blair’s secret meeting backing the Indonesian military. Today, Allan Nairn is back in the firehouse with us for part two of this discussion. We did invite Admiral Blair to join us on this broadcast, but he declined our request through a spokesperson, saying nominees would speak after the inauguration. Allan Nairn, to summarize, you were in East Timor in 1999 when the people East Timor were voting for independence. Can you talk about the period leading up to that and what Admiral Blair had to do with it? ALLAN NAIRN: The Indonesian military had invaded East Timor after a go-ahead from President Ford and Henry Kissinger. They killed a third of the population, the greatest proportional genocide since the Nazis. They established an occupation in which no one could speak, people could be dragged from their homes, tortured, executed at any moment. But the Timorese resisted. In ’91, there was a massacre outside the cemetery in Dili, the massacre which we survived. They killed hundreds of people. That got a bit of international attention. The political tide started to turn when Suharto, the US-backed dictator of Indonesia, fell in ’98. After that, the Timorese were granted the right to have a vote, a free election, a UN-supervised referendum, on whether they wanted to be independent. AMY GOODMAN: Liquica in East Timor. ALLAN NAIRN: In East Timor -— their entrails hanging from the walls, Admiral Blair, at that time the commander of US forces in the Pacific, personally went and met with the Indonesian military commander, General Wiranto. Blair had a mission, which had been given to him by the US State Department and White House, to tell Wiranto, “Stop the massacres.” Blair did not do that. He apparently defied what he had been sent to do, and he instead reassured Wiranto. This is according to the confidential cables which reported on the meeting, the US cables. He offered new US military aid to Wiranto. He invited him to come to Hawaii as his guest. He offered assistance for the Brimob, the paramilitary police that had directly participated in the Liquica massacre. When word got back to Washington, the State Department said, “You can’t do this. You have to talk to Wiranto again.” He called Wiranto on the phone and again did not tell him to shut the militias down. Wiranto was delighted. He escalated the militia terror. The killing of Timorese civilians increased. At one point, in July of ’99, Blair sent in his subordinate, Admiral Clemens, who was running the US Navy in the Pacific, for meetings with the Indonesian military about setting up a US base, training facility in Surabaya. The message from Admiral Blair was that the US military was backing Indonesia’s army as they were massacring churches and killing civilians in East Timor. Now, we just heard the clip where President-elect Obama said — he was talking about a departure from past practice. Yesterday, the think tank of Podesta, the transition chief for Obama, put out an item in which they said that the nomination of Blair and other officials is “indicative of Obama’s intent to work within rule of law.” Supporting those who were massacring churches is working within the rule of law. If that is the Obama administration’s definition of the rule of law, that means it is no departure from past US practice, because in dozens of countries over the years, the US has supported forces which kill civilians, and this suggests that Obama plans to continue that and simply say he’s complying with the law. AMY GOODMAN: Explain how you know what Dennis Blair, the admiral in charge of the Pacific Command at the time, said to General Wiranto in a private meeting. ALLAN NAIRN: I got the cables, which were the transcripts of the meetings prepared by Blair’s people. After they —- when they have meetings, they have their aides sitting there. They prepare an official report. It’s classified. It’s sent back to Washington. And I obtained those cables. AMY GOODMAN: You had a chance to question President Clinton about this. We went to East Timor, May 20th, 2002, at the time that the people of East Timor celebrated their independence, when East Timor became an independent nation. The next day, President Clinton, who was there representing, interestingly, President Bush at the time, President Clinton went to the building that was being dedicated as the US embassy in East Timor. And after he spoke, you questioned him about this whole situation and about Admiral Blair. This is an excerpt of your interaction. BILL CLINTON: Get to the point. ALLAN NAIRN: I’m getting to the point. I’m getting to the point. BILL CLINTON: You want to make a speech? Listen to him. Give him a hand. He’s giving a good speech. ALLAN NAIRN: I wanted to ask you about the facts, President. In 1999, in April, the Indonesian military and their militias massacred fifty people in the rectory in Liquica. They hacked them with machetes. Two days later, Admiral Blair, the commander for the Pacific, your commander, met with General Wiranto, the Indonesian commander. He offered to help him in lobbying the US Congress to get full US military training restored. He made no mention of the Liquica massacre. During that same period, the Indonesian militias rampaged here in downtown Dili. They attacked the house of Manuel Carrascalao. They massacred the refugees there. Yet you continued for months with aid to the Indonesian military. Why? BILL CLINTON: What’s your question, sir? ALLAN NAIRN: Why did you continue with aid to the Indonesian military if they were killing civilians? BILL CLINTON: First of all, I can’t answer the question you asked about Admiral Blair. You’ll have to ask him that, because I’m not aware of that. ALLAN NAIRN: He was working for you. Why did you continue military aid to Indonesia? BILL CLINTON: I understand that. I think, first of all, I don’t believe America or any of the other countries were sufficiently sensitive in the beginning and for a long time, a long time before 1999, going all the way back to the ’70s, to the suffering of the people of East Timor. I don’t think we can defend everything we did. AMY GOODMAN: That was an excerpt of your interaction, Allan Nairn, with President Clinton as he was dedicating the new US embassy in East Timor. His response — you specifically questioned him about Blair. ALLAN NAIRN: And he didn’t deny it. And Blair, at the time, did not issue a denial. And Blair — if it’s not true, Blair should come on here, and we can debate face-to-face. But it clearly is true. AMY GOODMAN: Was he carrying out US policy at the time, simply following orders? ALLAN NAIRN: No, at the time, he was — US policy had shifted at that moment, and Blair was actually going against the order to tell Wiranto to shut the militias down, even though the US, over the years, had supported the Indonesian military. This was a building victory for activism around the world, which was, through Congress, through the press, putting pressure on. But Blair defied it, and he continued to back the Indonesian military. AMY GOODMAN: What do you think this would mean for him if he became the Director of National Intelligence in the United States? ALLAN NAIRN: Well, it means that he would be one who continues to back the killing of civilians. The US has done that for years in Indonesia, in East Timor, in Guatemala, in El Salvador, in Colombia, in countless places. And Obama has a choice. When he takes office on the 20th, he will inherit a vast apparatus. That afternoon, he will become the world’s number one arms dealer. He will become the world’s number one trainer of paramilitaries. If he doesn’t immediately give an order to say “Stop, no more support for forces that kill civilians,” he — probably on that day, civilians will be killed by bullets, by shrapnel, with Obama’s name on it. That’s the choice he has to make. Right now in Gaza, it’s US shrapnel that is tearing the bodies of so many civilians there. The US ethic has been to say, “It’s OK. The law does not apply to us.” Mayor Bloomberg of New York just went to Israel and gave a press conference where he said that the international law of proportional response was stupid. He rejected it. AMY GOODMAN: Well, I want to go to this comment of Mayor Bloomberg and get your thoughts on him, exactly what he said. Yes, the New York mayor, Mayor Michael Bloomberg, was recently interviewed during his trip to Israel. He was there with the police chief of New York. He was there with Ray Flynn. We’ll play that clip in a minute. But before we go to that clip, I wanted to stay on Indonesia for another minute. In the last week, there was other news about the killing of an Indonesian human rights activist — this was years ago —- named Munir and the trial of the person who was accused of killing him. He was acquitted. Talk about what happened. AMY GOODMAN: He had ordered tea on the plane? ALLAN NAIRN: Well, it’s not clear if it was put into his drink or his food, but he was given a massive dose of arsenic. And he arrived in the Netherlands as a corpse. There’s extensive evidence implicating the Indonesian intelligence agency, BIN, the national intelligence agency, in his assassination. This took place in 2004. A trial was just completed of General Muchdi, one of the leaders of the BIN. The evidence against him was massive — cell phone calls, internal documents, testimony — but he was let go by the judges in the case, another — because Indonesian generals are not held to account for their involvement in killings, just as people like Admiral Blair are not held to account here. This followed the assassination in 2000 of Jafar Siddiq Hamzah, who was the leading Acehnese human rights activist. Ranking above [Muchdi] in the Indonesian intelligence agency, BIN, was Admiral Hendropriyono — I’m sorry, General Hendropriyono. General Hendropriyono was a protégé of US Intelligence and was so important to the US that he was granted direct meetings with the head of the CIA, at that time Tenet, and the head of the FBI, at that time Mueller. The investigators in Indonesia have not yet dared to approach Hendropriyono, but it’s clear that a serious investigation of the Munir assassination would have to look at this US intelligence protégé, as well. AMY GOODMAN: But this intelligence chief who was tried is free? ALLAN NAIRN: Yes, he got off. Now, there may be another trial, because there’s such a public outcry, but he’s feeling confident. AMY GOODMAN: Back to the Obama administration very quickly. We had you on a little while ago talking about the advisers to the presidential candidates. At the time, it was Hillary Clinton, it was Barack Obama. Now, Barack Obama has chosen the people he wants to constitute as his cabinet. Quick thoughts? ALLAN NAIRN: He’s continued Gates at the Pentagon. He’s talking about Jim Steinberg for the number two in the State Department under Hillary Clinton. Steinberg is someone who was involved in the decision-making and has openly defended the bombing of the Shifa pharmaceutical plant, which was one of the main pharmaceutical suppliers and evidently caused massive civilian suffering. Obama, by all indications, is continuing the longstanding US policy of backing the killing of civilians if the US feels it is necessary. The system works on autopilot. If he does not stand up on the first day and say he is stopping it, it will continue, and he’ll be responsible. AMY GOODMAN: Well, for example, he’s saying he will close Guantanamo. ALLAN NAIRN: That’s good. Right now liberals and Democrats are focused on the twists that Bush added to this system, US people directly involved in torture, Guantanamo, the chain of CIA secret prisons. Assume Obama shuts all that down. Then we’re just back to where we were before Bush, which was the US backing forces that kill civilians in dozens of countries around the world and torture being carried out with US support, except the torture is done by the local forces that the US is training and supplying. In El Salvador, for example, the CIA would give courses to members of the National Guard, the National Police and the Treasury Police. They would do the torture. The CIA people would stand in the next room. They would watch. They would slip in questions. So, if we go back to that system, is that — that doesn’t make any difference to the person being tortured, whether the hand that wields the razorblade is an American hand or a local hand. The problem is the torture itself. AMY GOODMAN: I wanted to go back to Mayor Bloomberg in Gaza, and this is where we’ll end. We have a clip of the news conference. He was interviewed by CNN after he went to Israel. MAYOR MICHAEL BLOOMBERG: If you’re in your apartment, and some emotionally disturbed person is banging on the door, screaming, “I’m going to come through this door and kill you!” do you want us to respond with one police officer, which is proportional, or with all the resources at our command? Just think about it in that context. There’s no so such thing as proportional response to terrorism. This is not a game that we’re playing by the Marquess of Queensbury rules. People’s lives are at risk. And I can tell you, in New York City, we would not do anything but use all our resources to keep you safe. And in America, we use all our resources to keep you safe. We wouldn’t get involved in these ridiculous things like proportionalism. Proportionalism is for theoreticians. The real world is, governments have a responsibility to protect their citizens with everything that they have. AMY GOODMAN: New York Mayor Michael Bloomberg. Final response, Allan Nairn? ALLAN NAIRN: Bloomberg says proportionalism is stupid, it’s “ridiculous.” Osama bin Laden would agree. This is the ethic of terrorism. By that standard, does that mean that the Palestinians are now allowed to start killing Israelis at the ratio of 100-to-1? Israel is now killing 100 Palestinians for every Israeli. Does that mean, with 600 Palestinians dead, there should now be 60,000 Israelis dead? And since Bloomberg rejects proportionalism entirely, that’s a license for Palestinians to kill all of Israel, to kill all of America, for everyone to kill everyone. This is the ethic and the logic of terrorists, and this is the ethic and the logic that still, unfortunately, governs the rulers of the United States. And Mayor Bloomberg was simply stating what is commonplace thinking. And unless Obama rejects that on his first day, the US will continue killing civilians. It’s right there in front of us. It’s right there in the statements. It’s right there in the actions. It’s there in the bodies of people who were torn up by American munitions. We’ve got to see it and stop it. AMY GOODMAN: Allan Nairn, I want to thank you for being with us, award-winning journalist, speaking to us here in New York. We’ll link to your blog at allannairn.com.